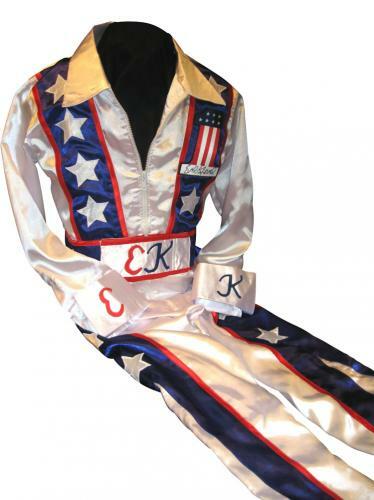 The daredevil Evel Knievel was born on October 17th, 1938 in Butte, Montana. He first developed a passion for stunting and adrenaline-rush activities when he was eight years old at an auto daredevil show. 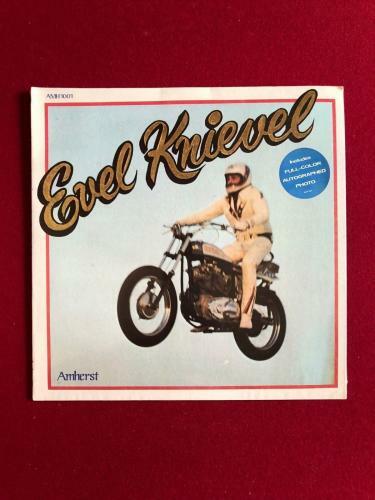 Five years later, he started stunting with his first motorcycle and soon after became a competitive ski jumper and minor league hockey player. He ran into trouble with the law since his young years with petty crimes and a kidnapping situation. 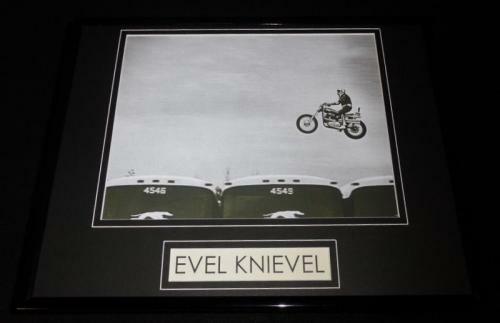 During the 1960’s, Evel Knievel began a traveling show that was called Evel Knievel’s Motorcycle Daredevils, which showcased Knievel and others amongst rattlesnakes, firewalls, and other exciting stunts. 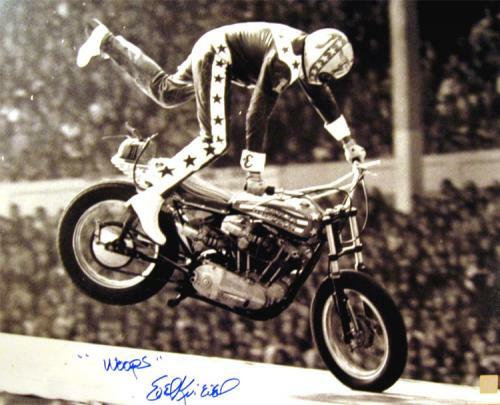 As a solo act, Knievel was a star whose jumps were incredible and unbelievable. 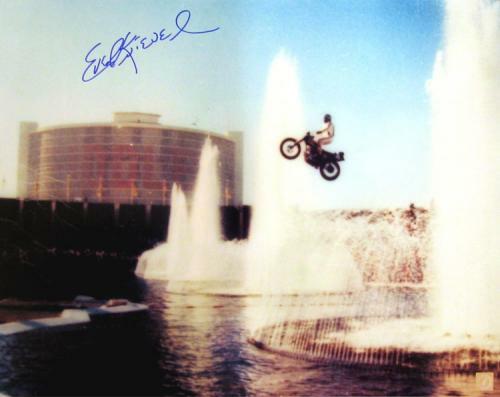 One of his greatest achievements came in 1967 in Las Vegas when he jumped across the fountains at Caesars Palace, jumping over 150 feet. 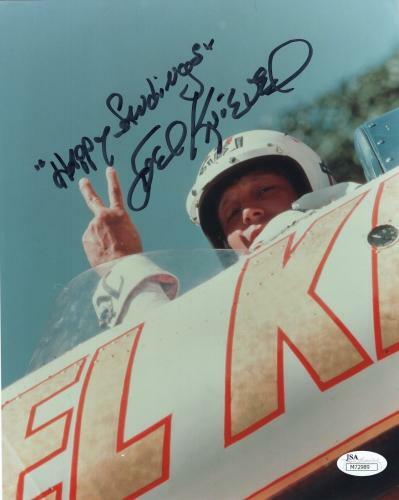 In Seattle three years later, he jumped thirteen cars and the following year in California he flew over 19 cars. He even tried to jump the Grand Canyon, but he and his attorney were denied permission to jump the Canyon. In 1974 he tried to jump the Snake River Canyon, but a prematurely-developed parachute caused him to drift backwards towards the water’s edge. 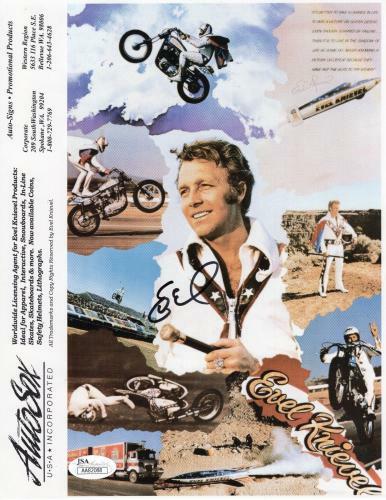 The next year in London he cleared 13 double-decker buses, although suffering injuries that had him saying he would never jump again; however, Knievel couldn’t repress the adrenaline-seeking voice within him and five months later, in Ohio, he jumped 14 Greyhound buses. He announced retirement in 1975 but ultimately didn’t retire until 1980. In 1978 he went to jail for beating the author of his biography Sheldon Saltman with a baseball bat because he didn’t like the book. He was arrested for beating a woman and was pinned under a motorcycle too. 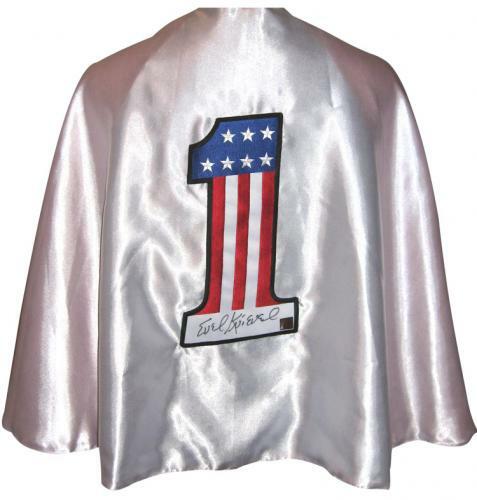 On November 20, 2007, Evel Knievel, unfortunately, passed away, but the daredevil’s stunts will forever be remembered. 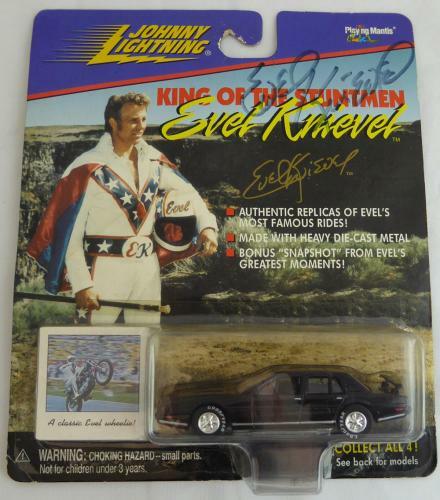 Cherish the stunts and action of Evel Knievel with the purchase of one of our Evel Knievel autographed collectibles. Be sure to purchase one of our signed photographs or autographed cut signatures before they are all gone, as these rare Hollywood collectibles are in high demand and are quick to go. 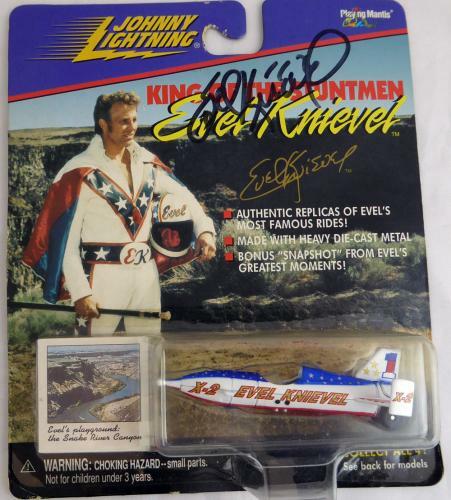 All of these Evel Knievel autographed memorabilia are guaranteed to come sealed with a certificate of authenticity and are guaranteed to put a smile on anyone’s face. 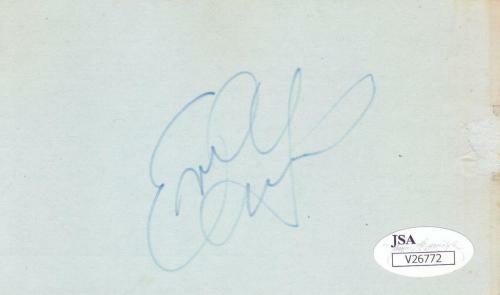 Evel Knievel Autographed Photos: Evel Knievel autographed photos portray the excitement behind the daredevil’s stunts. Spice up any living room or office wall with one of our autographed photos. 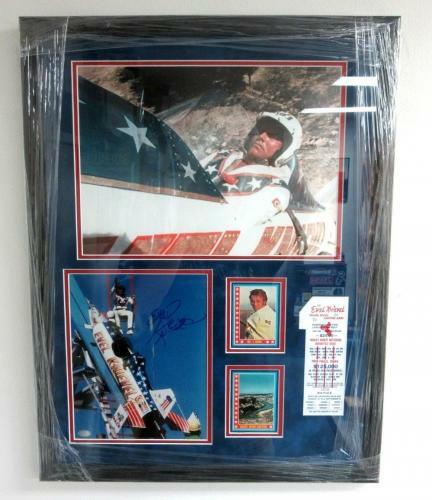 All of our Knievel signed photographs are 100% authentic and are unique and rare pieces of Hollywood memorabilia. 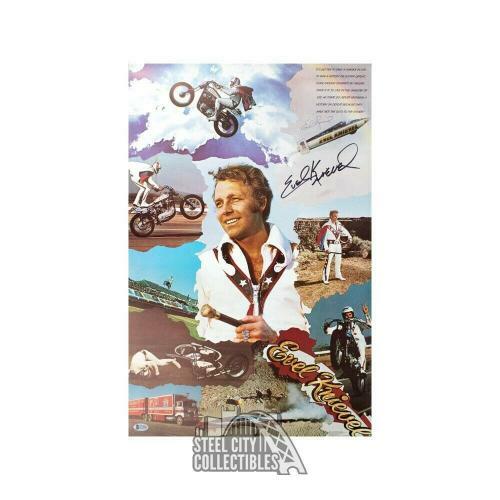 Evel Knievel Autographed Cut Signatures: Add worth and value to any collection with the purchase of one of our Evel Knievel autographed cut signatures. 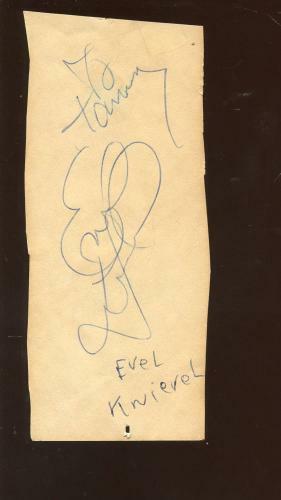 How could one be bored with an Evel Knievel autographed cut signature to remind him of the daredevil’s exciting stunts? 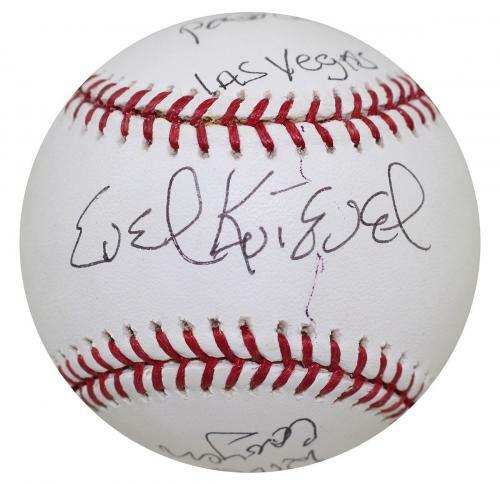 From clearing 13 double-decker buses in London to jumping 14 Greyhound buses in Ohio, he will always be remembered; there’s no better way to cherish his successes than with these certified authentic autographed collectibles.